Located near the NIGER RIVER in northern MALI, the town of Timbuktu rose to greatness as a center of trade in the 1300s. It was a stop on the caravan routes that crossed the SAHARA DESERT, and river traffic linked it with regions to the southeast and southwest. Culturally, Timbuktu was a point of connection between Islamic North Africa and the civilizations of western Africa. The city attracted merchants, scholars, and students from every direction. Timbuktu may have originated as a seasonal camp for the BERBERS, Saharan nomads who brought their livestock to water and pasture along the banks of the Niger. 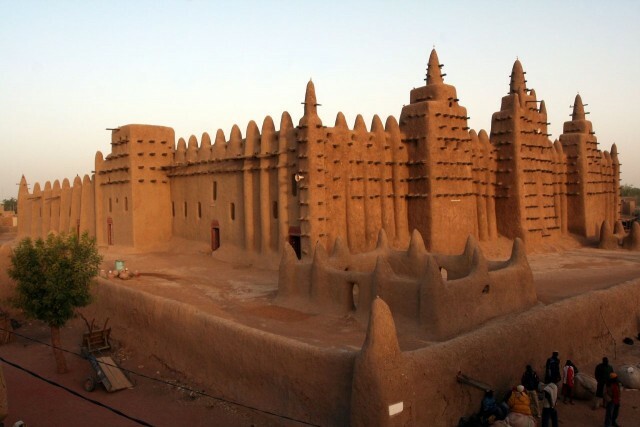 By the late 1200s it had become part of the empire of Mali. In 1325 the Malian ruler MANSA MUSA visited the city and ordered that a mosque be constructed there. Known as Djinguereber, or “The Great Mosque,” it has been enlarged and repaired many times and still stands. In the 1350s the great Arab traveler IBN BATTUTA stopped in Timbuktu during an African journey that included the leading cities of Mali. Timbuktu reached its peak in the 1500s, when it was part of the Songhai Empire. Traders passed through the city carrying gold from sub-Saharan Africa to the Mediterranean coast. The Sankore Mosque, the city’s second large mosque, was a center of advanced study in Islamic law and religion. Distinguished scholars taught students who spread their teachings widely in western Africa. The city’s glory was shattered in 1591, when an invading force from MOROCCO defeated the Songhai and took over much of their empire. The Moroccans made Timbuktu the capital of Songhai and set up local rulers called pashas. The pashas soon shook off the reins of Moroccan control and ruled Timbuktu as an independent state until the early 1800s. However, weakened by rivalries among the pashas, Timbuktu’s power and trade gradually declined.